When the co-organizers of the Armory Show—Arthur B. Davies, Walt Kuhn, and Walter Pach— were in Paris in late 1912 scouting works for the exhibition, they visited the Romanian-born modernist sculptor Constantin Brancusi in his studio. 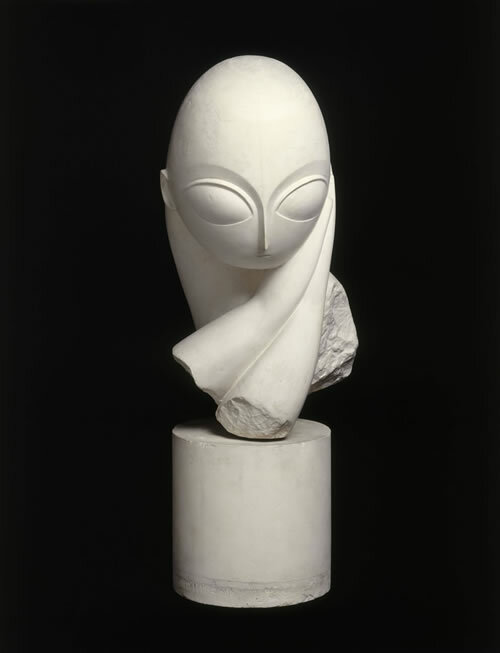 The men were so impressed by his work that they selected five examples to include in the upcoming show in New York, with Davies reportedly exclaiming to Pach, “That’s the kind of man I’m giving the show for.” On the spot Davies purchased Brancusi’s 1912 marble Torse (now at the Staatsgalerie Stuttgart, Germany), which he later lent to the exhibition. As the organizers expected, Brancusi’s modernist sculpture made a huge impact in New York—although most of the talk it generated was negative. The American sculpture on view in the exhibition was the traditional, representational, and conservative work that people in New York were accustomed to seeing. The extreme simplification of Brancusi’s sculpture was completely new and unexpected for most viewers, and it precipitated an unbelievable amount of both controversy and derision. Mlle. Pogany in particular became a favorite subject for ridicule, with many joking that she looked like a hardboiled egg perched on a sugar cube. The critic for the New York Herald described Mlle. Pogany as “a piece of sculpture that looks like an underdeveloped and deformed infant.” Many other reviewers followed suit, comparing the figure’s head to an egg. But there was a small group of more forward thinking Americans who were open to avant-garde art and appreciated what Brancusi was doing. Robert Chanler, the artist whose painted screens were also a great success at the exhibition, purchased a bronze version of Mlle. Pogany for $550—he had wanted to buy a version in marble, but it was too expensive. After the show closed, Kuhn purchased a plaster of Une Muse, which was later in the collection of the Guggenheim Museum in New York.